Recently I have been using driveway markers for stretching exercises in similar fashion as the MISIG. 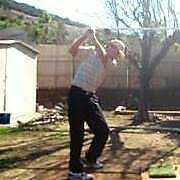 They can be used in any number of extension exercises, backswing, knee bends, upper and lower body. Because they are flexible, you can "bend" at the end of range of motion and HOLD. This provides some of the same resistance effect as bands. For the MISIG type, I simply let the trail hand slide and then switch hands and repeat in the opposite direction. OK for speed training as well.